In the world of beauty balms I am by no means a connoisseur, but I have tried a multitude of brands. I never found one that was well-suited to my skin. Maybe I expected too much, but for my oily skin with uneven pigmentation, I wanted something that would be light, fresh, and still even tone to some degree. 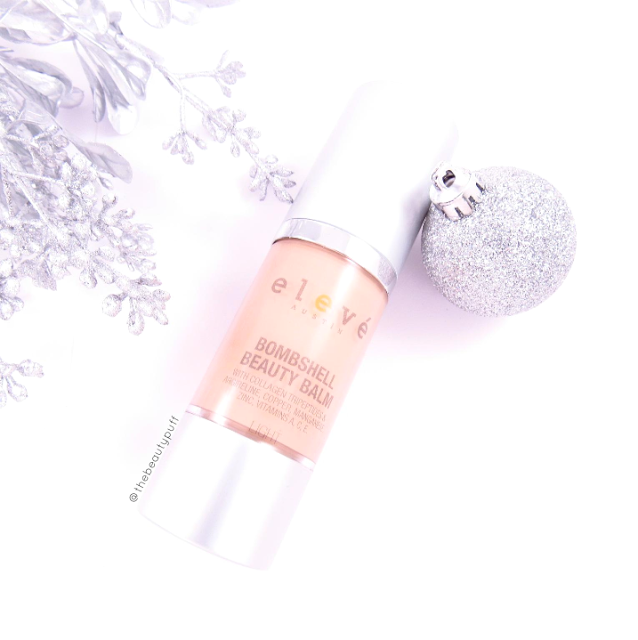 Nothing I tried fit the bill so I gave up on the idea, until I was introduced to Eleve's Bombshell Beauty Balm. Holy moly am I impressed. Bombshell does everything I want a liquid foundation to do, with the light, airiness of a powder foundation. My skin stays hydrated, looks even, and doesn't feel weighed down with heavy product. At night, I don't have that "I need to wash my face!" feeling I typically have after a long day of wearing foundation. My sensitive skin really thrives on a "less is more" regimen and this beauty balm has definitely fit that bill. I even wore it one day without setting it and it performed beautifully with minimal blotting. One of the ingredients is Kaolin, which absorbs oil. I think this is a big factor in why this beauty balm suits my skin so well! A light-weight, skin-loving product that helps control oil = a match made in heaven for my skin! In terms of finish, Bombshell gives the skin a natural, healthy finish without being too shiny or overly matte. It is just the right balance of coverage and lightness to minimize the need for concealer. I have used a bit of under-eye concealer, but other than that I haven't needed additional products. Not only does Bombshell have a fantastic finish on the skin, it does a lot behind the scenes as well. It soothes, protects, and hydrates skin while vitamins A, C, and E provide even more nourishing benefits, so you are getting maximum results each time you wear it! The convenient pump helps dispense just the right amount and also makes Bombshell the perfect travel companion! If you are looking for a natural, easy to use, multi-purpose product that doesn't feel heavy like a foundation, I highly recommend checking out Bombshell. I have turned to this product many times over the last few weeks when I need a quick, fresh look... love!! Use my code: thebeautypuff15 for 15% off your order PLUS free U.S. shipping!